Julie Anne Peters, April 2012. Man, for YEARS now I have really wanted to like a Julie Anne Peters book. I mean, she’s a mainstream Big Six writer of teen lesbian and trans fiction. She’s like the David Levithan of dykes – except that Levithan’s a brilliant writer and Peters, well, isn’t. But this book is different. 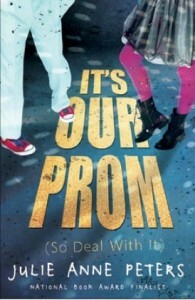 It’s narrated by two kids, Luke and Azure, who are determined to make this year’s prom an alternative that everyone can enjoy. Luke’s bi and Azure’s gay, so of course they want a prom without gender restrictions, but they go further than that – they want it cheap enough for everyone to afford, no formalwear required, Wii tournaments, free drugs, a tattoo parlor, and a drag show? Kids these days. But as they work out compromises among what they want, what the senior class wants, what’s allowed by school authorities, and what they can afford, they learn about teamwork and transcending their cliques in some nice and non-clichéd ways. Subplots abound: Azure and Luke both have crushes on Radhika, their third bestie. Azure’s ex is haunting the edges of her life and it’s making her sad and wistful. Luke’s brother, who owns a limo company, is a jerk and is also in charge of him while their parents are abroad….and I totally did not see the resolution of this one coming. The book is not perfect. It’s too long, and the romance bit with Azure and her ex is stupid, and I never did get a handle on Radhika. And I’m not sure why Ms. Peters’s editor didn’t correct her repeated references to “a monkey survey” (maybe in the finished version). Still: realistic characters with reasonable motivations, and no one dies in the end. Yay! This entry was posted in 2012, bisexual, drag, gay male, gaytopia, genderqueer, high school, lesbian, prom, queer adult, queer protagonist, realistic, romance, secondary queer character. Bookmark the permalink.